About two years ago, we made the decision to build and launch our own internal products in addition to our ongoing client services work. At the time, we did it to strengthen the entrepreneurial spirit of our employees and incrementally build new lines of revenue for 352. We learned rapidly, like many enterprises, that innovation projects come under fire the moment an idea leaves the drawing board. Though corporate intrapreneurs may understand the importance of innovation for long-term success, most enterprises simply are not structured to support the development of unproven new ventures. When we began developing internal products we realized we weren’t ready to support new product development either. Originally, we were sharing resources between client products and building our own products. We quickly discovered, just as we advise clients, we needed dedicated product teams to be successful. That meant more than just designers and developers on product; it meant we needed to ensure new ventures had the runway to find their product/market fit, and we had to ensure leadership at the highest level of the organization was squarely focused on innovation and driving product. Free your innovation teams from the core business. Corporations like Cox Enterprises often adopt a three-tier approach to their business units – a core business unit driving the bulk of revenue through existing products, an enterprise group to find incremental revenue opportunities and an innovation group tasked with thinking years ahead to develop new products. Since the core business unit drives the vast majority of revenue, it rightfully serves as the gravitational center of the organization. Things get murky, however, when leaders fail to define the roles of each business unit, and that center becomes a black hole, diverting personnel and budget from innovation projects to hit quarterly goals or develop incremental improvements to the core business. It’s a tempting trap, one that even the most disciplined organizations fall into. What good is an innovation team if it’s not allowed to focus on innovation? While corporate leaders may know long-term sustainability requires developing that next multi-million business through innovation, they need to look at innovation projects through a different lens. For innovation to succeed, you need to define what it means for your organization. If the goal is to think 5 years down the road and develop the next $100 million business unit, leaders can’t hold an innovation department accountable to the same Profit and Loss statement that guides the rest of the enterprise. It can be difficult for corporations to get out of their own way when it comes to tolerating the risk of innovation. Enterprises succeed by building systems and processes that focus on reliable, steady growth; as long as growth trends upward, the business is in good shape. While this protects the core business, even the most well-intentioned enterprise can inadvertently create an environment that pressures the innovation department to focus on adding incremental value rather than breakthrough innovation. Using those same P&L metrics to grade an innovation department almost guarantees the failure of that group – or at least a shift in focus. Rather than thinking big on new ventures, your innovation group may build a new add-on to the core business or find a new way to squeeze some extra revenue from a product. This is not to say an innovation group should operate without oversight until it finally lands a breakthrough – innovation should never be a leap of faith. But the measurements for success need to shift away from standard profit or loss to shift to more granular metrics. The metrics that protect the enterprise unit make it difficult to substantiate investment in innovation projects that may be counter to an organization’s short-term health. Metrics like market validation or percent-increase in user satisfaction may not have a place on the balance sheet, but they certainly indicate a product that deserves support. These resources will have priorities tied to maintaining the core business unit. Innovation groups should not be responsible (even partly) for maintaining enterprise products because goals and corporate priorities will always be at odds. Moving product development outside your organization’s walls to an external partner can help drive an innovation project forward, but there are a number of changes corporate leaders can make to protect their innovation groups. In The Lean Startup, Eric Ries outlines the tenets of innovation accounting to substantiate and measure your investment in new ventures. Innovation accounting shifts the metrics for success away from profit or loss to other items, namely proving if a product can sustain a profitable business in the future. Develop a minimum viable product to establish a baseline of real data generated by real customers. Your MVP should be narrow enough to deliver a single, powerful metric that either proves or disproves your business hypothesis. Equipped with baseline data, innovation teams should work rapidly across channels iteratively improve the impact of the product. Thinking in a lean manner helps bring executives back to the primary goal of innovation – new ventures may not create an immediate impact on revenue or be profitable in the short-term. Tracking the right metrics and showing early traction can remind the C-Suite that innovation is a long-term investment. Innovation departments need measurable objectives and expectations, but smart enterprises will focus on lean startup metrics like user acquisition or paid account activations over profit and revenue, which will likely be inappropriate to measure for the first years of a new product’s life. Getting comfortable with innovation accounting also requires a different mindset within the C-Suite. The pressures of the core business unit will always be present, and executives will always struggle to balance short-term health with long-term innovation. Keeping the C-Suite aligned behind breakthrough innovation requires a designated champion within the leadership team, given discretion over resource and budget allocation. We realized this early in the development of our first product, PlanningPoker.com. We gave its team dedicated time to build new features and stabilize the product, but the team was regularly pulled back onto client projects. While this brought revenue into the company, it did nothing to further our mission to build a great product, find customers and scale into a sustainable business. So we tasked someone to fight for it. We reorganized our Product Growth team with strategists, marketers, designers, developers and an EVP of Product to focus on bringing new products to market. Making new product innovation the responsibility of a single person within the leadership team allowed us to put goals and expectations on that person for what we wanted the organization to do and then align those expectations to our long-term vision. Empowering a chief entrepreneur or innovator can also bring much needed organization to innovation groups and serve to eliminate other tensions within the C-Suite. Namely, that tug-of-war for resources. The innovation department’s sole mission should be bringing breakthrough innovation to the marketplace. It requires a dedicated team capable of executing every step of the product lifecycle, not merely keeping their heads in the clouds to ideate. It should be tasked with developing and designing the product, launching it to market and get them growing without the innovation group having to fight for resources or share resources from other parts of the organization. Prioritizing innovation within the enterprise is a difficult task, and most corporations simply aren’t aligned properly to continually validate breakthrough ideas with small bets. 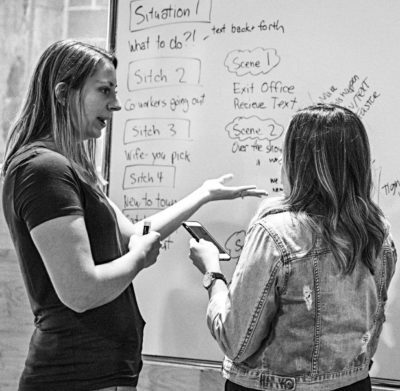 Empowering your team with the resources they need to take a lean approach will ensure new ventures resonate with customers and stay on track, even within the pressures of the enterprise. Want to learn more about intrapreneurship training? 352 Inc. is launching the Intrapreneurship Academy to deliver online training courses and an engaged community of innovators like you.